In a quest to continue being the go-to comic for creating the most nonsensical blogs, this week’s issue of Squirrel Girl uses basic computer science and counting in binary to deliver a splash page so fundamentally rad it should probably grace the cover of a mid-’80s metal album. Suffice to say, it’s rather brilliant. 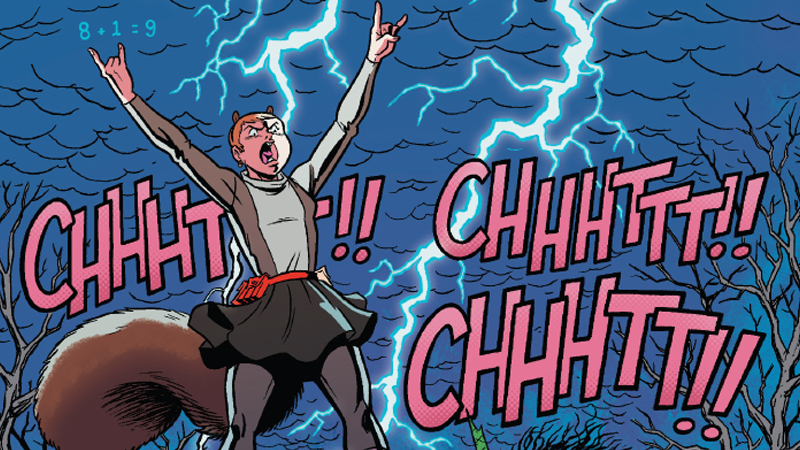 Unbeatable Squirrel Girl #11—written by Ryan North, and featuring guest artist Jacob Chabot and colors from Rico Renzi—takes a break from its usual adventures to deliver a wonderful dreamscape battle between Squirrel Girl and the villainous Nightmare. It starts off with a fight between Doreen and Doc Ock, which is how Doreen first learns she’s in a dream (because, of course, Ock has been dead for a few years now). So Doreen dazzles him with (computer) science, and in the process teaches us all how to count to huge numbers on one hand using the power of binary. Yes, this is still a superhero comic and not a piece of edutainment. Seriously, how is this not an album cover already? In short, Unbeatable Squirrel Girl #11 is the only superhero comic you can read this week that also teaches you how to count in binary on one hand, and some basic principals of computer programming. If that’s not a solid purchase recommendation, I don’t know what it is.